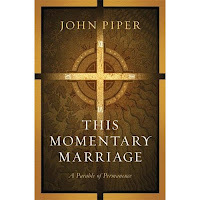 I have started reading John Piper's newest book, This Momentary Marriage: A Parable of Permanence. In this book, Piper unveils marriage as a temporary shadow of an eternal reality: the persistent pursuit and love of Jesus for His bride. This book is a tribute to love, commitment, covenant and life-long vows; but more than that, it is a book of mind-altering perspective in its reminder that this life and all of its institutions are quite far from permanent. Eternity is close at hand, and the shadows of this life will soon be replaced by the realities of forever.